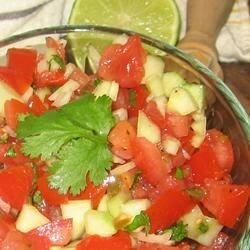 "This is a pico de gallo recipe that will have everyone asking 'how did you make this?' They will be surprised when you tell them the ingredients include a pickle!" In a medium bowl, combine the onion, jalapeno pepper, bell pepper, dill pickle, and diced tomatoes. Stir in lime juice and cilantro; season to taste with salt and pepper. Cover, and refrigerate at least 1 hour before serving, preferably overnight. See how to make a simple and super-fresh Mexican salsa. I basicly made this the same way, but instead of pickle I used a chopped seeded cucumber, and no red pepper. We had it that way in a Mexican Resteraunt[sp? ], My husband and I loved it. As far as improving on a such a simple dish, the pickle goes a long way. Lime juice a must and we added garlic. Very enjoyable. Great taste! I omitted the jalapeno and instead used Hot & Spicy Dill Babies for the pickles. Thanks! OMG they are so good going to make some more right now c ua latter !!!!!!!!!!!!!!!!!!!!!!!!!!!!!!!!!!! !